Home » Resources » Blog » Patient Stories » Roper Physical Therapy Patient Becomes the Match, an Inspiring Story! Every 3 minutes, an American is diagnosed with blood cancer. Only 30% of people will find a compatible bone marrow donor in their families, leaving the majority of those diagnosed to rely on potentially matching with strangers on the national bone marrow donation registry. Brian and Raizel Kahn put themselves on the DKMS (an international nonprofit dedicated to fighting blood cancers and disorders) registry about 5 years ago at a local JCC event. The couple each had their cheeks swabbed and provided their contact information. Fast forward to three months ago, Brian received a call from a representative of DKMS and was told that he was a match for a blood cancer patient. A few weeks later, Brian received an extensive physical exam at Baptist Hospital in Winston Salem, North Carolina. The exam verified that he was an ideal match for a 60-year-old man in Europe, while also confirming that he could donate with very little risk to his health. Once a donor is matched with someone, there are two ways to donate: (1) bone marrow donation, and (2) peripheral blood stem cell collection (PBSC). Only about 25% of cases require a bone marrow donation, a procedure which is performed under anesthesia and marrow cells are collected from the hip bone. 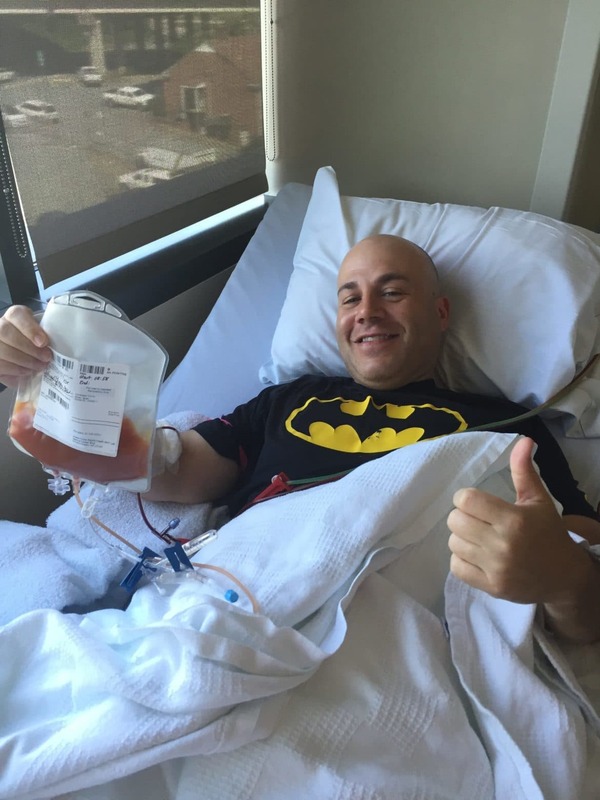 Brian participated in a PBSC donation, which is a non-surgical, out-patient procedure that collects stem cells. He received a 5-day program of filgrastim to increase blood stem cell production and underwent the treatment on the 5th day at Baptist Hospital in Winston Salem, North Carolina. Brian noted that the worst part was the insertion of IV lines in each arm. The rest was easy! At the end of the procedure, the bag of stem cells was rushed out on an evening flight, where the donation was received by the patient the next day. The Kahns wanted to emphasize what an amazing process this was for them and how easy it was to be a donor and potentially save someone’s life! You will never know if you are a match until you join the registry! Thank you to Raizel and Brian for sharing your story! Please check out the DKMS website for more information: www.dkms.org.